Austria’s Zillertal Valley is loaded with great family ski resorts, Mayrhofen – Hochzillertal/Hochfügen, Zillertal Arena, Spieljoch and Hintertux Glacier. An Austrian family ski trip to this alpine rich region promises plenty of skiing and Austrian charm, great ski schools for kids and plenty to do après ski from rodeling (sledding) to touring inside the Hintertux glacier. 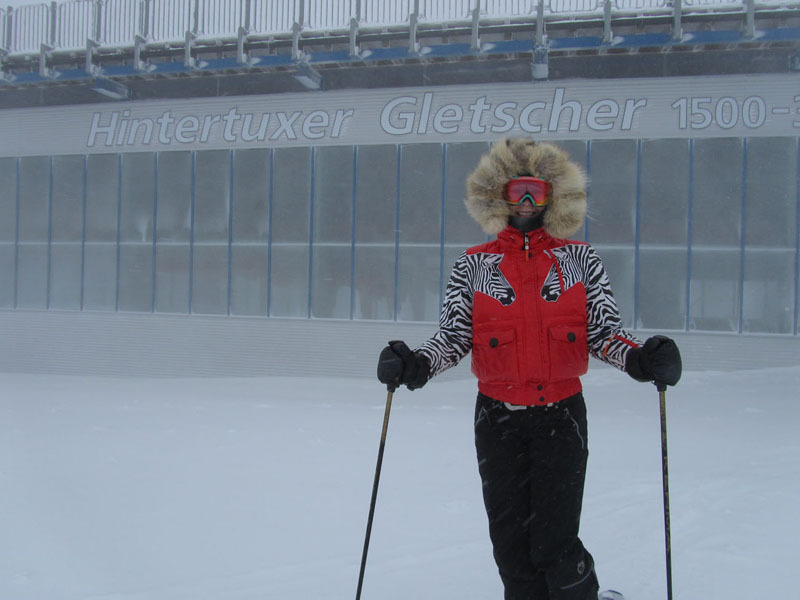 Hintertux Glacier is Austria’s only year round ski resort, open for skiing 365 days a year on the namesake glacier. With an elevation of 3,250 meters, 10,662’, the skiing is high elevation, gets serious natural snow and also wild weather from wind and clouds, to intense sun in the spring and summer. Hintertuxer Gletscher (in German) is in the Tyrol Alps of Austria, just a 30 minute drive from Mayrhofen, in the nearby Ziller valley, even closer to the charming Austrian towns of Finkenberg, and Tux (hence the name hinter-Tux). You ride three panoramic high capacity gondolas, called the Glacier Bus 1,2 and 3, to reach the top of Hintertux at 10,662’. On the high alpine glacier are 4 t-bars (common on glaciers) and two chairlifts plus the gondola. 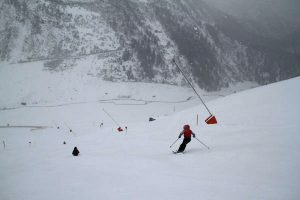 Hintertux claims only 17 prepared pistes that are groomed, wide, and well-covered. Despite that small trail count, Hintertux has 196 kilometers of skiing and 20 lifts, lots of terrain, well-pitched slopes, and gentle blue runs, on the summit Olperer and Kaserer plateaus. 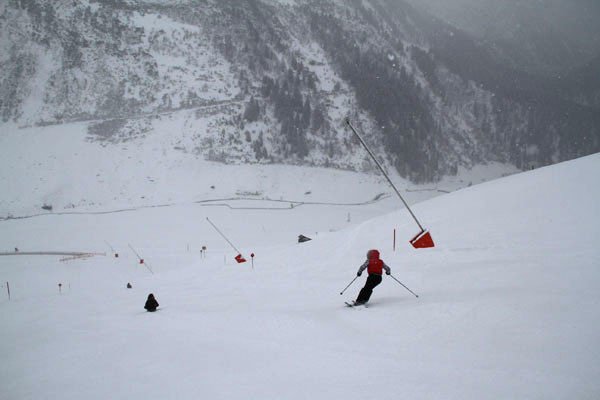 You will also find a few steeper long runs at Hintertux. The longest is the 7,000’ vertical run to the base. Hintertux is the training ground for 57 national ski teams and snowboard competitors since the skiing on the glacier is open for skiing year round. There is also a double chair, Larmstange that serves off-piste skiing but you should be very wary of cliffs, crevasses, and ever changing snow conditions on this high alpine glacier. Skiing on a glacier at such high elevation, you can experience strong wind and white out conditions, particular in the heart of the winter weather, since they are no trees for definition, just poles on each side of the trails. Hintertux has the highest terrain park in Austria as well. Tuxer Fernerhaus is a beautiful lodge at mid-mountain for lunch. This stunning lodge was rebuilt in 2013 with a beautiful bar, panoramic sit down restaurant called Wirsthaus, and expansive self-serve café – all of which have fireplaces and gorgeous authentic wood work, even the restrooms are top shelf. The Hintertux Glacier Tour is a must – yes go inside the glacier. The Nature Ice Palace (see Video of inside the Hintertux Glacier) is a series of cool (0C, 32F) caves under the snowpack, 30-meters below the ski slopes. Roman Erler, who may be your guide if you’re lucky, discovered a crack in the glacier in 2007 that led to this ice cave which is now open for tours of the stalagmites, waterfalls and underground lake. You actually get in an inflatable boat (in ski boots) surrounded by ice and paddle up and down the Ice Sea, 100 meters of ice canal on this glacial lake beneath the ski slopes. It’s fascinating, to be under the ski slopes, in this ice world – home to the oldest but most stable ice glacier in Europe. For $16Euro it’s an unbelievable opportunity to tour, but be warned – climbing ladders in icy caves is for fit, flexible people, and children over 6. Scientists from NASA and seismologists come to Hintertux for research, cold water divers practice swimming here (brr) and you get to tour this “cool” glacier, its an hour break from skiing. Hintertux is part of the Ziller Super Ski Pass which includes Mayrhofen – Penken/Ahorn,Hochziller- Hochfügen, Zillertal Arena and Spieljoch – providing skiers with 506 kilometers of skiing served by 181 lifts in 4 ski regions. You can lodge right at the base of Hintertux’s first gondola, there are several hotels and guesthouses, a few ski shops and après ski bars at this quiet valley’s end. Or you can stay down the road at the larger ski town of Mayrhofen. Your ski pass allows you free bus connections. A ski holiday at Hintertux can be combined with visits to other ski areas in Austria’s Tyrol, Mayrhofen, SkiWelt, Kitzbuhel, Innsbruck’s nine ski areas. Austria is home to over 85 ski areas, extremely concentrated within a few hours in the Tyrol, and some of the Best Ski Resorts in Europe.